Kornheiser and Wilbon will also be calling that evening's game. PTI is doing something it doesn’t do very often later this month – hit the road. 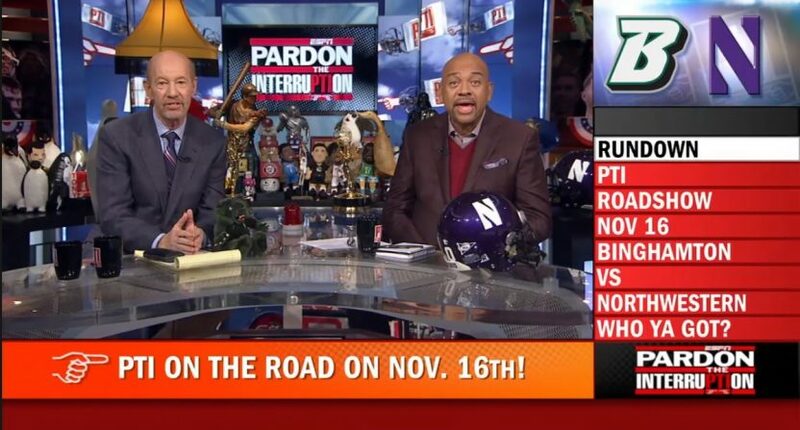 On November 16th, Pardon the Interruption is taking its act to (of all places) Evanston, Illinois, where an episode will be filmed before that evening’s Binghamton-Northwestern college basketball game. If you’re confused about the significance of this game, you’re not missing something amazing – PTI cohost Tony Kornheiser went to Binghamton, and Michael Wilbon famously went to Northwestern (which I believe he’s mentioned once or twice). And oh yeah – in addition to taping the episode of PTI, the pair will be calling the game on ESPNEWS with play by play broadcaster Will Flemming. PTI put together a video hyping the road show. At the very least, this will give people a reason to watch Binghamton-Northwestern. The schedule on November 16th is actually quite a busy one for ESPN, with an NBA doubleheader and a Top Rank boxing event on the mothership, a bunch of college basketball tournament games and one college football game (Memphis-SMU) on ESPN2, and even more college basketball on ESPNU. The ESPNEWS schedule prior to the PTI-centric broadcast is loaded with its usual slate of reruns and radio simulcasts (along with one UEFA National League game, hell yeah), so throwing one live basketball game (even one as unappealing as Binghamton-Northwestern) on the network should help a little bit.